I was given the exciting opportunity to speak about my work with Berkeley Brean of News10NBC last week. He asked many thoughtful questions. My answers were necessarily brief in the story, so I am using my blog to expound upon those answers. Many of the popular press articles that address media marathoning pathologize this behavior without fully understanding it. My use of the term “media marathoning” (in place of the more common phrase “media bingeing”) represents a positively-valenced look at this media consumption trend. Although media marathoning may involve some anti-social or uneahlthy behaviors–ignoring friends, work, and/or dietary needs–my study reveals that media marathoning has numerous positive features: It allows readers and viewers to use cognitively-dense thought processes to critique a text, to regain their health while immersing themselves in a story world, and to even reflect on their morals. With great commitment (to a text) can come great reward in the areas of mind, body, and spirit. 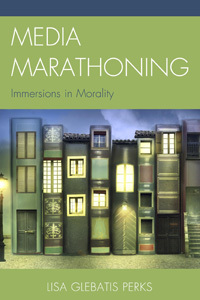 Several marathoners cited their text’s complexity as a primary factor encouraging their rapid consumption, re-marathoning, and/or careful attention to the text. For example, television marathoner Jeff said The Sopranos was “intellectually and creatively engaging” so he elevated its artistic status to that of a “dense book or novel.” Marathoning enables readers of complex texts to have both a microscopic and macroscopic look at the story world. Mark, marathoner of the James Bond, Toy Story, and Sherlock Holmes film series, captured this holistic look in his statement, “I like to see how the films stand alone as well as how they tell a complete, larger story.” Marathoning can clearly be more than mindless entertainment. In addition to my previous post cataloging how media marathoning can be used to soothe during pregnancy, childbirth, and the tough first months of parenting, the marathoning discourse I have gathered contains many examples of people using their texts to cope with illness or recover from surgery. Karl recalled, “I had a week where I got sick. I had the flu. And it’s like: ‘What else am I gonna do? I’m stuck laying on the couch all week so I’ll just watch House all week. '” Meghan was drawn into the Millennium book series because a family member had given her the first book to entertain her as she recovered from surgery. Hannah Goldfield of The New Yorker also cited illness as a contributing factor in her Breaking Bad and Gossip Girl marathons. The second half of my book manuscript explicates character types and themes repeated in commonly marathoned texts. This part of the book explains my News10NBC comment that marathoned texts offer insight into where we’ve been and where we’re going as a society. Each character study suggests an ideal way of being, through expounding upon regretful decisions, capturing the consequences of morally questionable actions, or idealizing particular character traits. The common plot themes offer cautionary tales of corrupted power and suggest ways to effect social change. These texts suggest that readers and viewers want our moral compasses tuned and strengthened. Thank you, Samwise the Brave. September 22, 2013 in Uncategorized.